Speck, designer of fun and functional cases for popular gadgets, today released two new iPad 2 cases for the holidays: the sleek, form-fitting MagFolio and MagFolio Luxe, made with genuine leather. Both cases feature built-in magnetic closures that work seamlessly with the iPad 2's sleep/wake function. 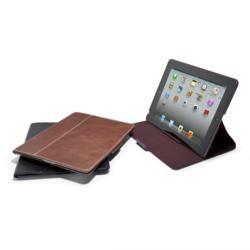 Perfect for the gadget-loving professional on your gift-giving list, the MagFolio Luxe features a durable and protective premium, top-grain leather cover, and a form-fit cradle that holds your iPad 2 firmly in place. Available in four distinctive leathers, the MagFolio Luxe also functions as a multi-angle stand for hands-free viewing in landscape or portrait mode. Speck's new MagFolio offers the same form-fit cradle, multi-angle stand and magnetic functionality as the MagFolio Luxe, but adds the extra protection and durability of a padded cover. The MagFolio is available in sleek, stylish black vegan leather. Check out the new MagFolio line-up, plus all of Speck’s iPad, iPhone, Android and eReader cases and covers at http://www.speckproducts.com. Founded in 2001, Palo Alto-based Speck is a leading designer of form-fit cases for the latest popular portable electronic devices. Speck is obsessed with designing cases that are just as smart and indispensable as the gadgets they protect. Founded by a group of design engineers, and located in the heart of Silicon Valley, we are captivated by technology, fanatical about our gadgets, and consumed with making products people love. Our focus on what people care about inspires us to craft cases that are a perfect fit. We make cases that don’t just protect phones, MacBooks, and tablets – they also contain clever details that spark delight in our customers. For more information, follow Speck on Twitter and Facebook.